Jaimie has a flair for detail-observation and being sensitive to her bride's features. From her deduction she then builds a look tailored to their face and personality that unleashes the natural beauty within. For example she changes the contour of the eyes to make them look more energized and emphasizes the features to beautify the appearance; Every woman has her own attractive qualities. It is important to know how to bring them out. To match the #off-shoulder romantic lace wedding dress, Jaimie created the silky complexion using a radiant formula that infuses into the skin. The dewy and fresh base is important to match the softened makeup. 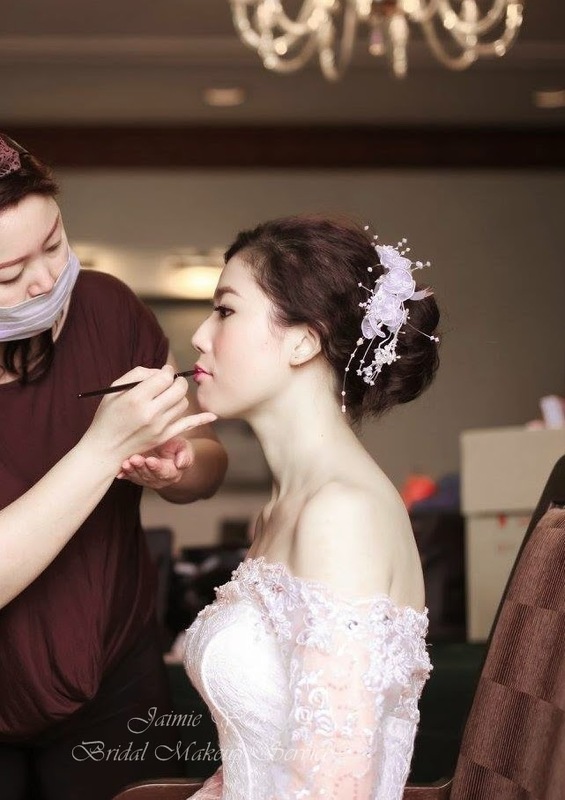 She opted for the creamy rose pink lips to give the bride that youthful look. For a sweet glow, blush of peaches on the cheekbones is all you need. 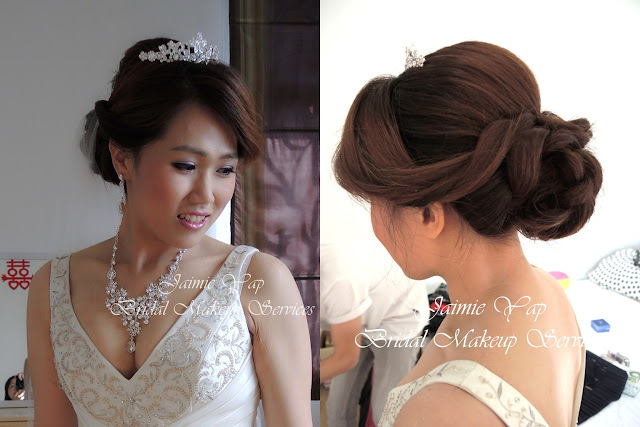 The hair's natural waviness is kept to produce the elegant updo which looked more natural. Finally a floral hairpiece that goes perfectly well with the attire of the day. Here's one for a more grand and jeweled gown. Voluminous up style with a tiara give the bride the glam look for a queenly affair. Her eyes are accentuated well and the colors blended in naturally without any patches. 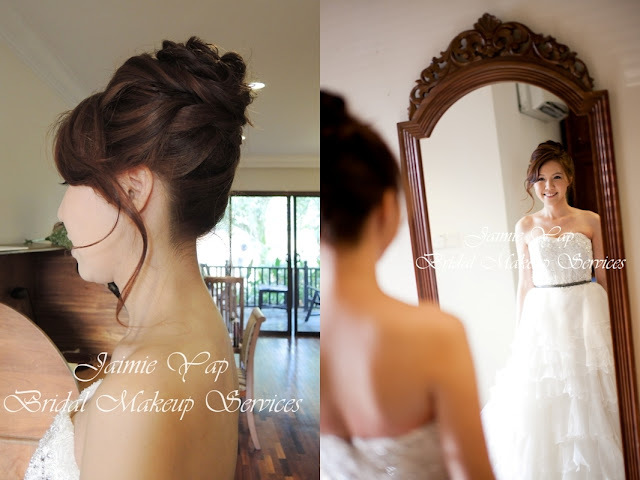 Each style is carefully thought through by Jaimie based on the bride's facial features, shape and what she is wearing. The eyeliner makes the eyes appear rounder, bigger and more captivating - creates the illusion that the face and nose are slimmer. Sparse (not so dense) false eye lashes help balance the overall look, they are more natural. 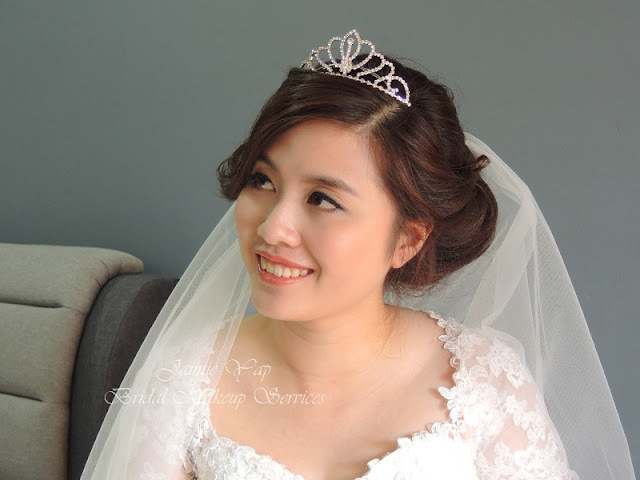 I think the loose front hair is a nice touch that adds glamor and class to the bridal makeover. 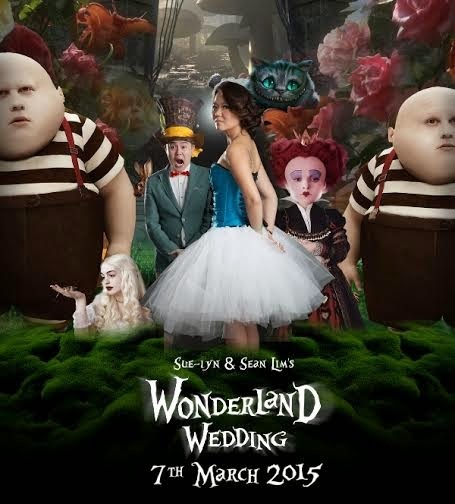 Theme: "Alice in Wonderland". The natural makeup and hair that fit the special theme wonderfully. Found Jaimie while browsing for makeup artists for my wedding. Completely satisfied that I did. Loved her makeup from the pre wedding till actual day. She focuses on making her clients look natural and enhancing their features so you won't be looking at 'another person' in your wedding pictures. Jaimie puts a lot of care into her work; is extremely meticulous and will check in on you before the wedding regarding styles and general skin care etc.